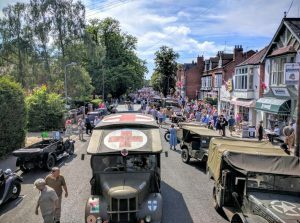 The 1940's Festival is organised by a team of volunteers from Woodhall Spa under the chairmanship of Andy Hunter. The event takes quite some organising with exhibitors and re-enactors coming to participate from across the country. The Festival finances itself, however funds need to be raised for medical cover, insurance, traffic management, hall rental, equipment hire, transport etc. This is done through charging for car parking, the 200 Club plus donations and sponsorship from local businesses. The Festival organisers take no fee or any sort of income from funds raised. Instead, the aim is spend all monies raised on keeping the Festival financially viable. If you have skills or resources that you'd like to offer the Festival please do contact us. Thank you for your interest in our Festival.